It looks like Nokia is working on its own phablet, after all. Initial rumours indicated that the Finnish company was prepping an extra-large Lumia phone as Microsoft worked on a GDR3 update for Windows Phone 8, which adds support for full HD displays. The phablet, codenamed Bandit, will sport a 6-inch Full HD display, a Snapdragon 800 chipset, and a rear camera that is “at least 20MP”. 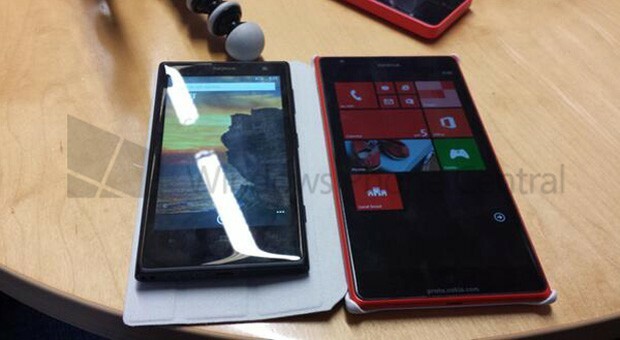 The latest leaked image of the Bandit phone, seen above posing next to a Lumia 1020, shows the sheer size of the device. The 4.5-inch Lumia 1020 is a big device, but looks significantly smaller in the image above. Also visible are the extra Live Tile columns on the screen, as well as the proto.nokia.com insignia at the bottom of all Nokia’s prototype devices. Further, serial leaker @evleaks revealed on Twitter that the Bandit phablet will eventually be called the Lumia 1520. While there is no word on when this smartphone will be released, Engadget states that a late September launch date has been mooted, which may also be when the company’s Windows RT tablet will be released.